Although most of my work is very “one-of-a-kind” and organic in nature, being a professional means that I don’t mess around with my wirework! It takes time and practice to achieve a clean line, and it can be difficult to get repeatable results. One of the things I’ve been doing for years is to always prototype and document my new work. Whenever I develop a project for a class, I write out notes and sketch my ideas – many don’t work out, but I often find an element of the idea that appeals to me, and I wind up using it for something totally different. I also teach my students one of the “tricks” I use for wire components, which helps to really ensure repeatability – I create wire templates. 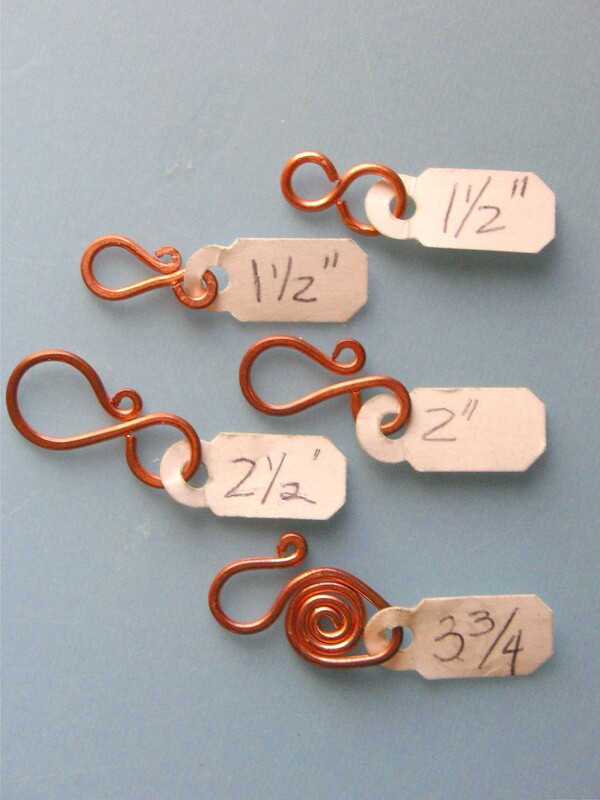 Once I know HOW to make something, I like to play around with different wire gauges and lengths – there’s no such thing as “one size fits all” so if something works, I always see how far I can take it! 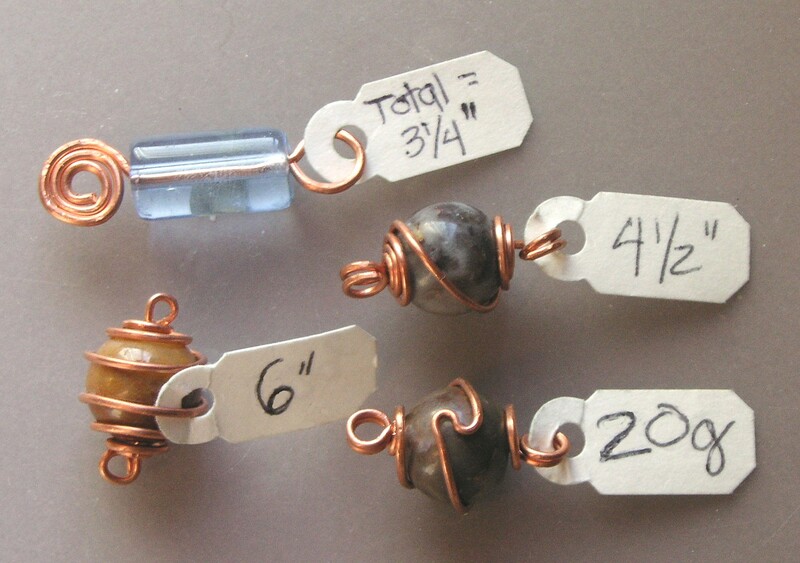 In the photo above, it’s easy to see how the different length of wire makes clasps of different sizes (you can learn to make a wire clasp in this TUTORIAL). This way, I can just pick the clasp that works for my project, and easily make it the same size. On one side of the tag I mark the wire gauge, on the other, the length. Not just for clasps – I make this type of template for other wire components (such as wire spirals HERE), as well as these wire wrapped beads, so I can make sure to cut the right size wire when making bead links (I just love making the link with the zigzag on the wrap!). 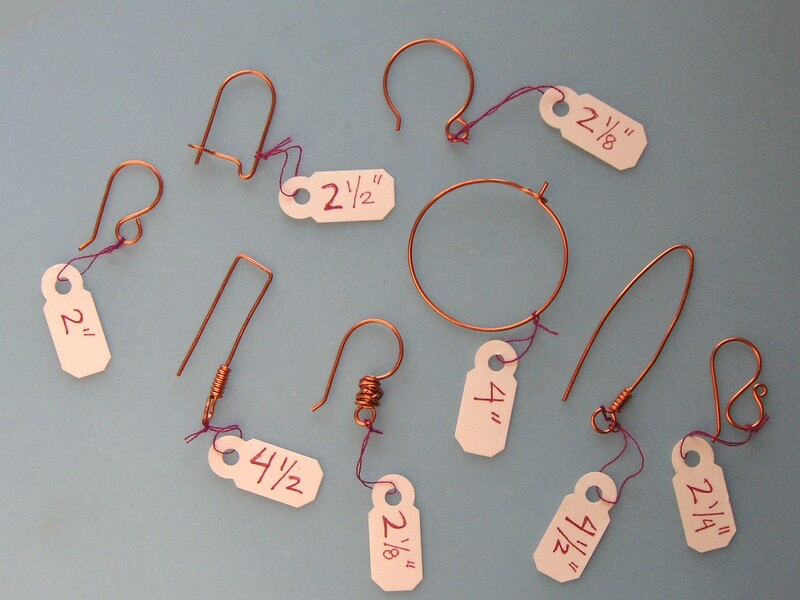 And if you like to make earwires that are as creative as your earrings, than wire templates are a great help – it’s important to get the proportions accurate. I love creating different earwires – these are the ones I use most because they are the most flexible. You can make a whole earring wardrobe using simple gemstone or pearl drops, and putting them on different wires! I have already posted two tutorials in this blog for SIMPLE EARWIRES and SIMPLE HOOPS – I always seem to get alot of folks who check out the wire tutorials, so I’m thinking it’s time to post a few more… any favorites?? Just post a comment, and I’ll see what I can do! Great post. Love the ideas. Goes back to the basics but with a lot of class!! Thanks!!!! New here, and new to making my own wire findings too- thanks for this great tutorial! One of the best tips. Makes a lot of sense to make prototypes with the info attached. You think you’ll remember what you used/did but you don’t. I’ve been enjoying your blog this am. Thanks! Thank you for posting this trick. As I am making more and more jewelry, this is becoming a necessity. I can’t count how much wire I have wasted creating “identical” links. This will definitely come in handy. Love all your tutorials. They are very helpful. Thank you. Thanks for a lovely tutorial. I started working with copper wire jewelry recently, and I find your tips to be very important for standardizing work!